Yoga, an ancient form of art, meditation and working out that began in India, can help you shed stress and lose weight. If you are too frugal or busy to sign up for a yoga class, then the next best thing is to buy a yoga DVD. You can learn about how to master yoga from the comfort of your home while watching pros at work. This is an absolute beginner’s guide to yoga with thorough instructions on each basic move you need to know. If you have never tried yoga before, this is the DVD you need to start with. The DVD is presented by an experienced yoga instructor who is patient and clear when giving instructions. You will get introduced to this millennia old practice gently, without any heavy Sanskrit references. The general aim of this DVD is to get people introduced to yoga as a fitness exercise. By the end of the session, you would have learned one or two yoga moves you can incorporate into a daily fitness regimen. This DVD also provides excellent instructions on the philosophy behind yoga and how you can use this practice to energize yourself in daily life. The DVD contains a number of workouts ranging from 10 to 50 minutes. The instructions scenes are shot in peaceful settings like sunny beaches, which will help you to become motivated and stay calm. 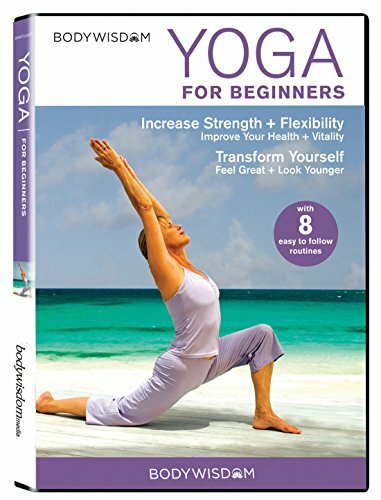 This DVD is a wonderful guide to anyone who wants to learn yoga from scratch. This yoga DVD is shot by the celebrity fitness instructor Gillian Michaels. It’s most suited for people who are at least slightly familiar with yoga. But beginners are welcome to dive in and try. Those who are already well versed in yoga can benefit from the careful instructions as well. The guide includes workout sessions focused on mastering the basics and conquering some of the hard moves that increase overall flexibility. Jillian Michaels is quite good at giving instructions so that you loosen up and get ready to try the gravity defying poses. Sessions are presented individually in the DVD, so you can focus on one thing at a time. You don’t have to sit through the entire DVD in one session. You can master one session and move on to the next. Most sessions combine difficult power yoga poses with mind, beginner moves. Training techniques are highly dynamic and is intended to appeal to watchers with varying degrees of yoga expertise. Some focus is given to weight loss aspects as well. Unfortunately, no warm ups or cool down sessions are presented so you will have to come up with your own. One of the major appeals of yoga is that it leads to less stress and more content life. This DVD is focused on instructions that will help you to relieve stress via yoga. 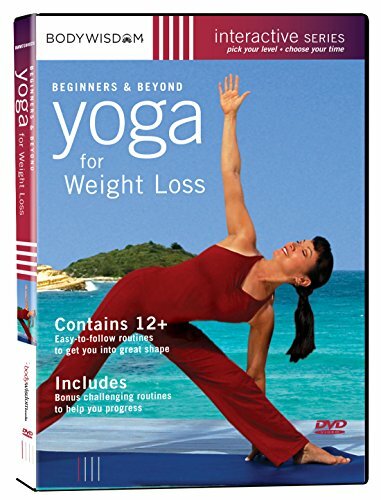 It’s unique in the sense that most yoga DVDs are focused on weight loss or muscle toning. This one focuses on sessions that have a direct impact on your brain and overall wellbeing. Presented by a calm and gentle instructor, the sessions focus on getting your body and mind to relax. In the process, you will lose weight and get fit as well (if you practice frequently). There’s little to no focus on weight, so you can forget about that and just concentrate on relaxing your mind. Instructions will gently guide viewers from a novice level to expert. Sessions are presented in individual and group fashion. You will also be greeted with calming scenery involving a lot of green and blue. This yoga DVD is exclusively intended to help viewers lose weight. The DVD includes 12 routines that take up from 15 to 60 minutes. In addition to losing weight, this DVD will help you develop a consistent fitness routine that includes yoga in part or completely. The recorded instructions start at the beginner level with easy poses and short routines. Sessions will gradually get intensive so you have time to adapt. You will learn to practice breathing and calming down in addition to trying sweat-inducing poses to lose weight. The taped sessions included are guided by experienced yoga masters Michael Wohl and Maggie Rhoades. Anyone of any gender or age can benefit from the sessions in this DVD. At the end of the DVD, you will come out with a foundational understanding of yoga and most likely an invigorated motive to lose weight. Physical yoga will only be part of your weight loss plan. You will also have to practice the breathing lessons that will help you maintain a healthy diet with firm mental resolve. This is the ultimate yoga DVD for fitness buffs. A basic understanding of yoga will be helpful when starting out with this DVD, but it’s not required. This DVD includes long and short sessions that show how to do power poses that increases bodily stamina, endurance and strength. If you want to build up your core or add muscle and lose fat, this is will be the yoga DVD you need. Sessions are shot in a motivational manner at charming settings like balmy beaches. Each session focuses on building a core aspect, like stamina or endurance. Sessions are presented by experienced yoga guide Rodney Yee. His instructions are clear and concise. It’s easy to understand what’s going on without having to watch a scene for more than once. Be aware that some poses will be challenging and will require you to give your fullest. You can easily master the basic poses you might already know with this DVD guide. Conclusion: When you do yoga at home by yourself, you could be making mistakes without even realizing it. You can perfect your poses and challenge yourself by buying one of the above yoga DVDs. It will definitely beat the price of having to sign up for a yoga class.